Here’s a look at what the Nissan Kicks for India is going to have on offer when it goes on sale. Nissan has announced that the company has commenced production of its Kicks mid-size SUV for India at the company’s Chennai production facility. While the market launch of the car is scheduled for January of 2019, we will be driving the car next week ahead of its market entry. Here’s an understanding of what you should be looking out for in the Kicks. 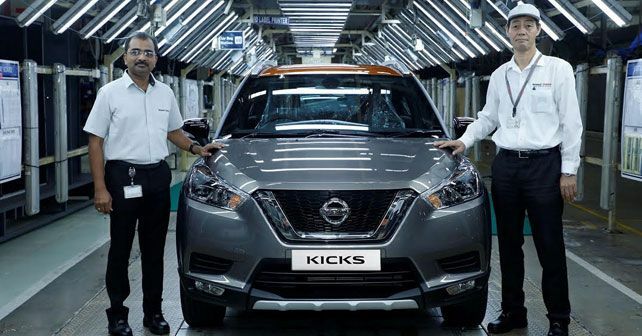 All-new Kicks for India: While Nissan has been selling the Kicks in international markets, the model we are going to have here in India is completely different. The Nissan Kicks for India is built on the current India-spec Renault Duster / Nissan Terrano platform, which happens to be the Nissan-Renault BO platform. It’s worth mentioning at this point that the international spec Nissan Kicks is built on the new Nissan V platform. Why is the India spec Kicks different from the international model? The Nissan V platform is designed to underpin compact cars in international markets. And its application is limited to front-wheel drive models only. With the Kicks in India, Nissan is aiming at the mid-size SUV segment. As a result, the BO platform allows the India spec model to be larger than the international Kicks. How big is the India spec Nissan Kicks? The Nissan Kicks for India measures in at 4,384mm in length, 1,813mm in width and 1,656mm in height. This makes the India spec kicks longer, wider and taller than its international counterpart. This is something that will let the Kicks have more imposing road presence, allowing for a greater SUV appeal. Powertrain options: Unlike the international model, the India spec Kicks will have a diesel option on offer as well. Engine options will include Nissan’s 1.5 litre, four cylinder petrol and diesel engines. The 1.5 litre petrol unit is a naturally aspirated one that is good for 102bhp of max power and 148Nm of torque in the current Nissan Terrano petrol. The Terrano petrol is offered with a five-speed manual transmission. The diesel 1.5 litre engine of course is turbocharged and generates 81bhp of max power and 200Nm of peak torque in the five-speed manual Terrano. There is also a more powerful version of the engine with 107bhp of max power and 245Nm of peak torque. This specification is on offer with a six-speed manual gearbox as well as an automatic option. The Kicks for India is expected to be introduced in manual guise at the moment. And since this car is built on the BO platform, it is capable of being offered with AWD. At the time of launch though, the Kicks in India will purely be a front-wheel drive vehicle. What about equipment? While there are no official details at the moment, the Kicks for India should come loaded with equipment to take on its competition. Which means there should be LED head lamps, a new infotainment system and a host of convenience features.